Blurb: The students of Green Lane Academy roam their halls unaware that below their manicured campus exists a prestigious school of an entirely different kind . . .
Now Phoebe’s lessons about Shaper’s enemies and spycraft take on great importance as a menace stalks the campus, with Phoebe as its target. Meanwhile, what began as an unlikely relationship with Colten, quickly morphs into heartache when she suspects that something sinister lurks beneath this movie star’s glitter and fame. Suddenly, Phoebe’s caught in a mesh of lies, betrayals, and danger where she doesn’t know who to trust, and needs to rely on herself–and her secret power—to get to the truth and to stay alive. 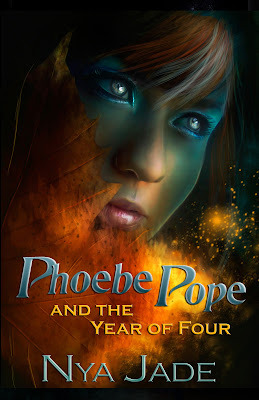 Giveaway:Singer-songwriter Nya Jade is celebrating the upcoming release of her debut YA novel, Phoebe Pope and the Year of Four, with a Tiffany & Co. gift card giveaway!! I couldn’t get it to work either. 🙁 This is a rafflecopter hosted by someone else so there is nothing I can do to change it. The signals connect with concentrated nerve places, which in turn spread the signal to the whole abdominal location.